EDIT: Seems the Kaiser Chiefs have pulled down Little Shocks from Soundcloud. You can still scroll down and check out the video though. You know what’s more then a little shock? The fact that this band just released the new song and video overnight. Without warning to pretty much the general public + everyone else. I love this sudden drop from a band that has always delivered in the past and the Kaiser Chiefs have a long history of delivering. In fact this band is really far from a rare indie gem because everyone else will soon hear this one throughout the land. The song Little Shocks is just too damn good not to share! You got to love the sense that somethings off but in an edgy and danceable way all the same. Those intro bells and on going pino riff add the right amount of classiness needed for these Brit Rockers to stay in line with their inde genre and fans. I’m not saying this song is too different from songs past, but its just simply showing the band has come a long way from their debut album Employment released a good 6 years ago. If you follow the way the band has changed over the years it does seem only right for them to reach this sound. You have to stand out somehow to get some attention these days, or at least be signed with a good record company. I wish I knew more about when the next Kaiser Chief LP is set to come out but no such news yet. I feel that they will be releasing some info soon, but only after the storm of people swarming to listen and catch up with the band due to their 2 and a half year absence since the release of their third and latest LP Off With Their Heads in 2008. I just had to bite on this one. So I also decided to post the new music video for Little Shocks as well for your viewing pleasure. Enjoy! Categories: Song of the Day! 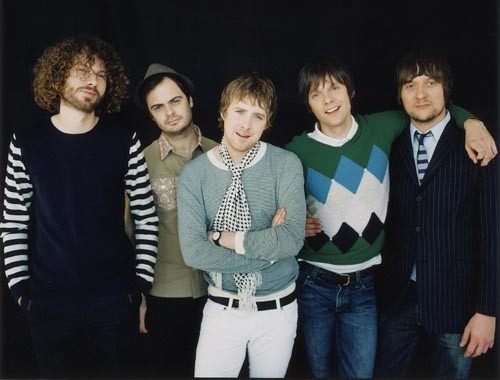 | Tags: 2011, 5/31/11, Alternative, Brit Rock, Brit-Pop, British, Employment, Indie Rock, Kaiser Chiefs, Little Shocks, Music Video, New, Off With Their Heads, Video | Permalink.